The SG12 will be the first model in the new grab series for release; it has a grab area of 3.6 sq. ft. (.33 sq m) and is suitable for excavators in the 6.6 to 13 ton (6 to 12 t) class. Engcon's new generation of rock and sorting grapples will be on display at bauma, held in Munich, April 8 to 14, 2019. Fifteen years have passed since Engcon launched the SK stone and sorting grabs, and over the years they have become increasingly common accessories that make excavators even more useful and flexible. 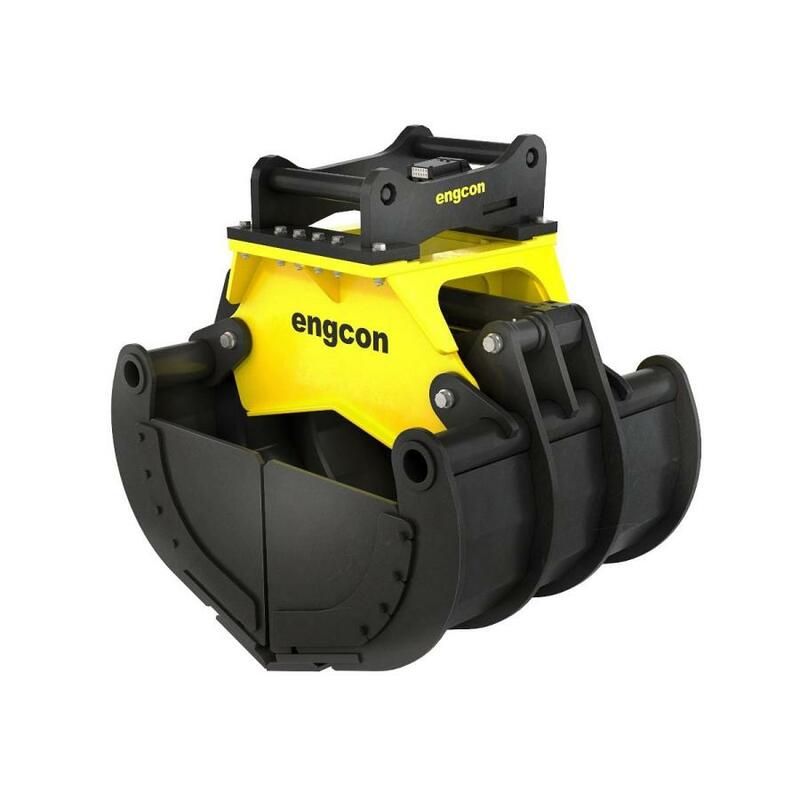 But because tiltrotators have developed a great deal in 15 years and excavators are now more powerful, Engcon is adapting the grabs to meet today's needs by strengthening them and making them more suitable as accessories. "In addition to strengthening the new grabs to make them more suitable for new generation tiltrotators and excavators, we will make sure they are more suitable as accessories," said Johan Johansson, designer at Engcon Group. Johansson said the grab arms will be closer together to more easily retain small items that otherwise would run through the grabs. They also will come ready for the installation of side plates. This will make converting a stone and sorting grab into a clamshell bucket quick and easy. As before, the attachment points will be bolted on and ready for Engcon's EC-Oil connector. All joints will be fitted with expander bolts to minimize play, cutters will be bolted-on for simple replacement and ready for mounting bucket teeth. The new grabs will be available in six sizes suitable for excavators from 1.6 to 36 tons (1.5 to 33 t). The SG12 will be the first model in the new grab series for release; it has a grab area of 3.6 sq. ft. (.33 sq m) and is suitable for excavators in the 6.6 to 13 ton (6 to 12 t) class. Production is planned to begin in the summer of 2019, but the new stone and sorting grab will be demonstrated at bauma 2019.